Vedantu.com - No.1 online tutoring company in India provides you Free PDF download of NCERT Solutions for Class 6 Maths Chapter 10 - Mensuration solved by Expert Teachers as per NCERT (CBSE) Book guidelines. All Mensuration Exercise Questions with Solutions to help you to revise complete Syllabus and Score More marks. Register for our free webinar class with best mathematics tutor in India. 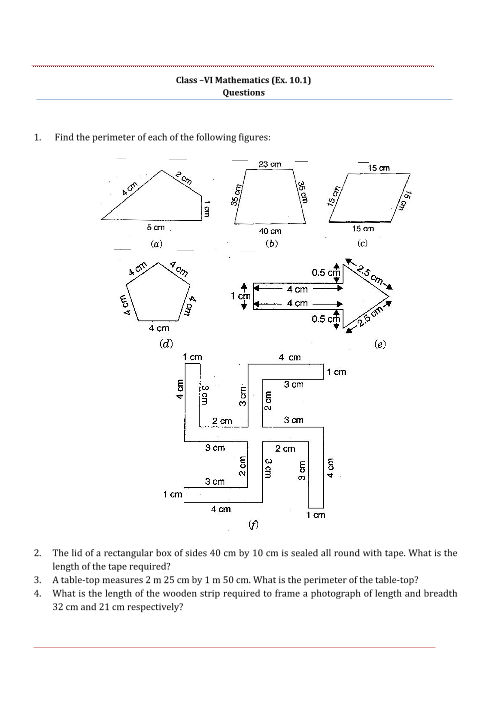 NCERT Grade 6 Mathematics Chapter 10, Mensuration deals with measurement of shapes and figures by their area and volume. The chapter begins with the measurement of perimeter of shapes and gradually transcends into measurement of area. Introduction to Mensuration, Introduction to measurement of Perimeter, Perimeter of a rectangle, Perimeter of regular shapes, Introduction to measurement of Area, Area of a rectangle and Area of a square are the main topics discussed in this chapter. New concepts, interesting problems, solved and unsolved examples and simple language, make NCERT Grade 6 Mathematics Chapter 10, Mensuration interesting and fun to learn. Get 100 percent accurate NCERT Solutions for Class 6 Maths Chapter 10 (Mensuration) solved by expert Maths teachers. We provide step by step solutions for questions given in class 6 maths text-book as per CBSE Board guidelines from the latest NCERT book for class 6 maths. The topics and sub-topics in Chapter 10 Mensuration are given below. Ex 10.3.2 - Area of a square. EXERCISE 10.3 - 12 Questions with Solutions. Other than given exercises, you should also practice all the solved examples given in the book to clear your concepts on Mensuration. You can also download the free PDF of Chapter 10 Mensuration and take the print out to keep it handy for your exam preparation.